What Americans now deem beautiful has not always been called such. The origins or modern fashion (and even hairstyles), however, find their roots in a variety of origins, not the least of which is late 16th century Western Europe! The article below is an interesting collection of information about techniques and apparatus that women used to maintain high fashion. We’ve come a long way, ladies! The following article was originally published at http://www.modehistorique.com/elizabethan/farthingales.html and was titled Farthingales & Bumrolls and was written by Sarah Lorraine Goodman. Farthingale: Current opinion among most costumers is that there are three types of farthingales: The Spanish (cone) Farthingale, the French (pad) Farthingale and the Wheel (Drum) Farthingale. These three styles of undergarment are distinct in construction as well as silhouette. Sometimes the wheel and French farthingales are confused to to mean a drum shaped farthingale supported by large pads. The purpose of this paper is to clear up some of the confusion and debate over what constitutes a farthingale vs. a “bumroll” and how we might revise conventional “wisdom” to distinguish how each garment was worn. Bumroll: A pad of various sizes that is worn in conjunction with all three styles of farthingale. Again, the pad differs greatly in size, depending on what farthingale (and consequently, what era of dress) is being worn. Once more, conventional “wisdom” asserts that a bumroll was worn with a farthingale, however it is this author’s opinion that such a hypothesis is not totally accurate. The Spanish Farthingale: The very first farthingale that is depicted in art was essentially a brocade gown, borne out by hoops of reed, painted by Pedro Garcia de Benabarre, a late-15th century Spanish artist. This style was relatively short lived and didn’t seem to exist outside of certain regions of Spain. By about 1495, the hoops moved beneath the outermost skirt but the farthingale was still far from widespread. Popular myth seems to state that the first time anyone other than a Spaniard had set eyes on a farthingale was when Catherine of Aragon made her state entrance into England in the year 1501, although this was probably not the case. It is very likely that this was the first time that England had seen the farthingale, but considering that the youngest Infanta’s numerous sisters were married far and wide across the Known World, it is much more likely that these Spanish women had been popularizing the farthingale for a few years proceeding Catherine’s marriage to Arthur Tudor. It should be noted, however, that universal acceptance of the Spanish farthingale did not appear until some 50 years later, in both England and France. German style most likely did not allow for the farthingale, and there is scant evidence to suggest that Italians were making use of it. Overall, it appears that the Spanish farthingale was almost strictly regulated to Spain, France and England. The French Farthingale: As the name suggests,this style of farthingale seemed to have originated in France. Some sources suggest that it was popularized by the “French Queen”, although who precisely that would be is up to some debate. We do know that the French Farthingale appears to have been firmly accepted by the year 1570, which would suggest that the French Queen in question might well be Margot,the larger than life Queen of Navarre, who was by far the driving force behind fashion throughout her life. 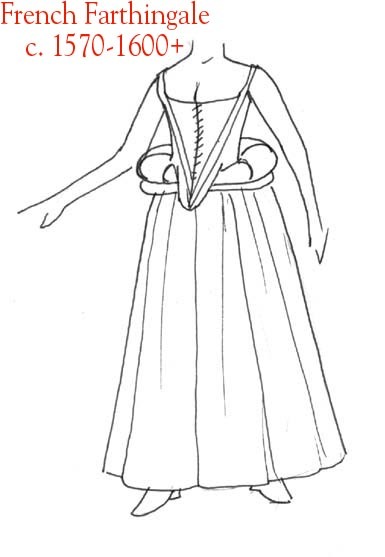 This style of farthingale does not resemble the Spanish farthingale in the least. It is essentially a large pad, either stuffed or borne out by reeds (hence the retention of the name “farthingale” which is the anglicized version of the Spanish vertudgado, roughly referring to the reed that was used to bone the skirt). It is common among modern reenactors to add a second, smaller pad beneath the French farthingale to add support. This style of farthingale creates the distinctive “dome” shaped skirts of the later 2/3rds of the 16th century. The style seems to have crept into England by 1577, when Elizabeth I began wearing them. There is no evidence that this style of farthingale was used by the Spanish, who seemed to prefer the sever conical shape of their original farthingale throughout the century. Again, the Germans and Italians seemed to largely ignore this style of farthingale as well. The Wheel Farthingale: As we will see further down in this article, the Wheel farthingale (also known as a “Drum” farthingale) is possibly a late 18th century concept and not used in contemporary 16th century fashion. However, at this point I feel it is necessary to describe the Wheel farthingale in terms of how it was worn and what place it took in 16th century society. The earliest datable pictorial evidence of something similar to a Wheel farthingale comes from a painting of a masque around 1615 C.E. As it is almost a generation after the Wheel farthingale was supposedly worn and it is of a masque ballet, the picture is not considered good evidence of an actual garment. However, for the most part the concept of the Wheel farthingale works well to explain how the “torso served on a large plate” look was achieved from the late 1580’s to the early 1600’s. In theory, the Wheel farthingale is simply a circle of fabric with a hole in the center for the waist, boned with concentric reeds. Among the reenacting and theatrical costumers, it is usually worn with a smaller supporting pad beneath it. The look of the Wheel farthingale was popular for about the last 10-15 years of the 16th century, and really only worn by the upperclasses. It appears only in English and French artwork. The bumroll is often cited as being a necessary component of ALL 16th century costume. This is most decidedly inaccurate. First, let us examine what exactly a bumroll is. The simplest definition is that it is a padded crescent worn slightly below the waist to accentuate the hips. It can vary in size from quite modest to indecently large and purportedly serves some purpose in keeping the weight of heavy skirts from pulling the stitching out of the waistband. I’m not going to point fingers as to where the bumroll myth originated, but the earliest source in my library comes up as Jean Hunnisette. While I hold her in high esteem, she is a theatrical costumer, NOT a costume historian. Her aim is to accurately create the image of a particular era, and while that often requires a great amount of research, her task, when boiled down, is not to get the details 100% accurate. The bumroll is something that is at best a guess at how the skirts of 16th century gowns were supported, but it is not mentioned before the later 16th century, and at which point it appears to be a term reserved for a lower class structure, perhaps similar in proportion to the more fashionable and expensive French farthingale. The reference is found in Ben Jonson’s play, “The Poetaster”, Act II, Scene I, Line XVI, dated 1601. Within the context of the play, the character Chloe has married beneath her station and is irritated with having to abandon her finery for the simpler fashions of the middle class. 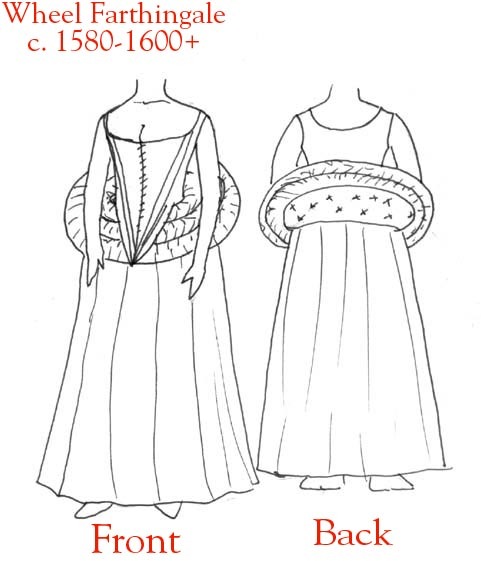 Her reference to “bum-rowls” likely indicates that this garment was a cheaper alternative to the French farthingale, possibly similar in structure, which allowed a lower class woman to obtain a fashionable shape, perhaps without using up more expensive resources required in a French farthingale. Janet Arnold notes a reference to a “rolle of cotton”, one hundred years after the previous quote, which she supposes was used to support a French farthingale (Queen Elizabeth’s Wardrobe Unlock’d, p. 146). The notion of the caderas pastizas is intriguing, because it would support the idea of a possibly seperate garment in the 16th century. Unfortunately, I have been unable to dig up another reference to it. Another practice common throughout the 16th century was padding the pleats of the skirt, by a length of rolled wool or cotton which was stitched to the underside of the pleats. The references to this are numerous, however, there are no extant garments that show this type of padding. Also, there is nothing to suggest that such a structure as the caderas pastizas was a separate garment. We see numerous depiction of the Spanish farthingale in Spanish, English and French art throughout the first half of the 16th century, however we do not see any kind of separate hip pad. With the profusion of cartoons mocking female fashions from this period, the only reference to a bumroll is seen only at the extreme end of the 16th century. While I believe that padding is undeniable, I am hesitant to say that the modern interpretation of the bumroll is accurate for female costume prior to 1570. The reference to this is debatable because it does not refer to a specific date or the nature of these rolls, but further research lead me to a 16th century ropa that had “stays” stitched on the underside of the pleats in the back piece. This was essentially a strip of fabric that was sewn to the backside of the pleats to hold them in place. (Arnold, Patterns Of Fashion figure 269, page 38) I assume that what Janet Arnold refers to in the above passage was something more in line with the stays, and not a separate piece to be worn around the waist. 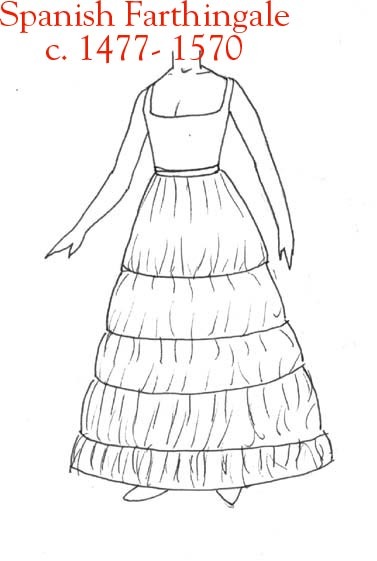 Outside of Ruth M. Anderson’s abbreviate reference to the caderas pastizas, there is little to suggest the use of a separate form of padding worn in conjunction with the Spanish farthingale.